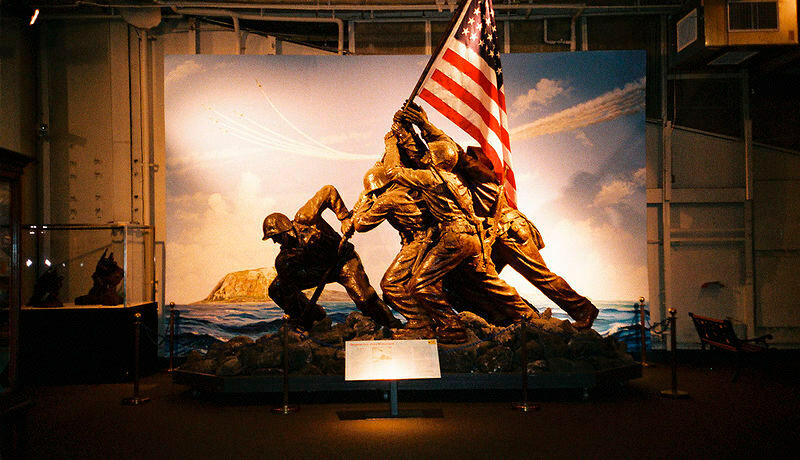 The 5×4 inch sheet of film that photographer Joe Rosenthal exposed on Mount Suribachi during World War II was transformed in 1954 into a 60 foot high bronze sculpture. This is a unique metamorphosis: from film to bronze, from 2D to 3D, from small to large. 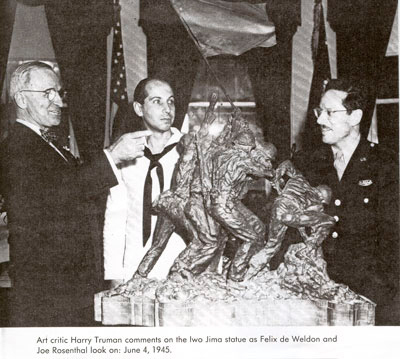 The sculptor of the Iwo Jima monument was Felix de Weldon, a Vienna-born artist who achieved fame as a sculptor in Britain before arriving in the US. 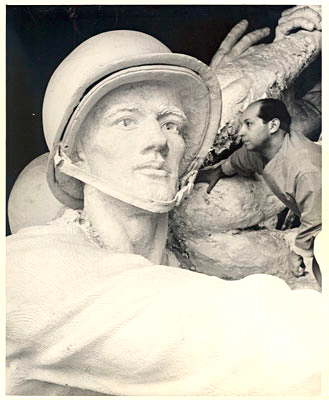 He can be seen in these photographs of the making of the Marine Corps monument. These strange images record his transformation of the photograph into a giant sculpture. 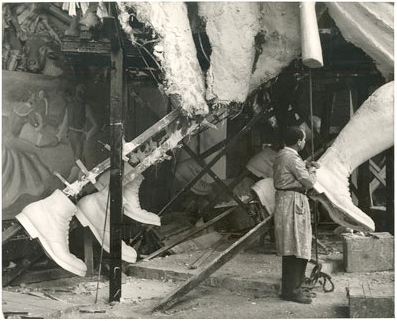 De Weldon refines the soldier’s boots that have been attached to the steel framework. Each figure was designed without clothing in order to duplicate the muscle tone of the stretched and straining bodies. De Weldon views the figures of Harlan Block and Rene Gagnon. De Weldon refines the figure of John Bradley. 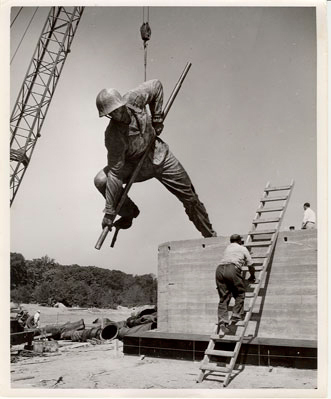 Bronze figure of Harlan Block being moved to the base of the memorial in Arlington. 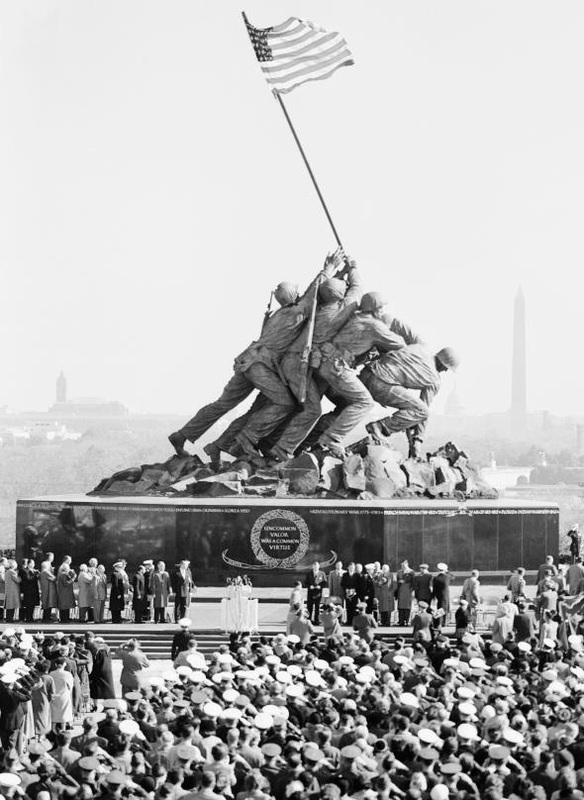 The final result is the Iwo Jima memorial at the Arlington National Cemetry, opened in 1954. 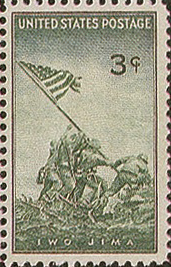 The Iwo Jima photograph is unique in the history of photography for its amazing transformation into other art forms. This simple two dimensional black & white print metamorphosed into a 3D clay model, then into a 32 foot foot high bronze sculpture. It was transformed from a photograph into an engraving on a postage stamp. And its stillness was brought to animate life in two Hollywood movies. Surely no other single photograph has changed form so much, spread so widely, and made so much money? Here is a timeline of its various afterlives. 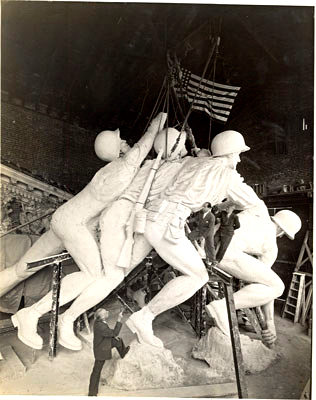 February 1945: Upon seeing the photograph for the first time, sculptor Felix de Weldon transforms it into a clay model. April 1945: De Weldon (centre) is photographed with his model, alongside the photographer Joe Rosenthal (right), and President Truman. July 1945: A US postage stamp showing the Rosenthal photograph is released. 137,000 stamps are issued. 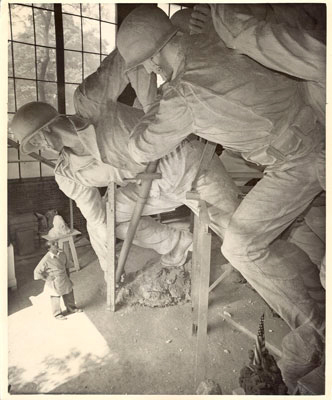 Spring 1945: De Weldon makes a series of life size sculptures which are paraded around the US, in a campaign that helped to raise over $20 billion for the war effort. The last surviving model is now on display on the USS Intrepid in New York harbour. 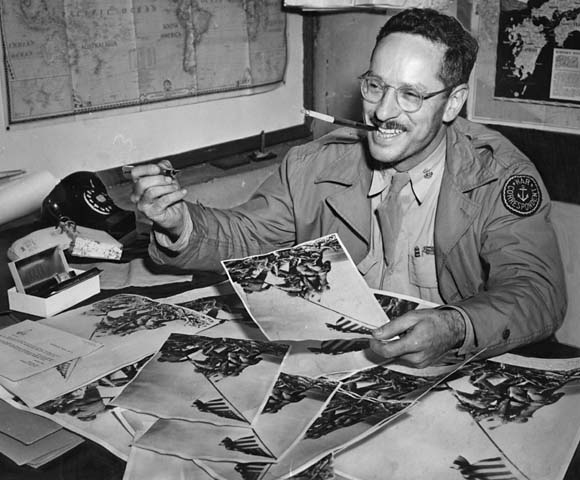 1945: Joe Rosenthal wins the Pulitzer Prize for Photography. 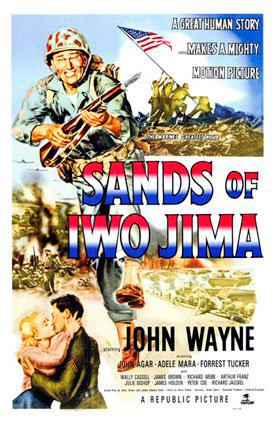 December 1949: The Sands of Iwo Jima premieres, a movie starring John Wayne, about the invasion of the island of Iwo Jima. It includes a reenactment of the raising of the flag. The movie is a hit. 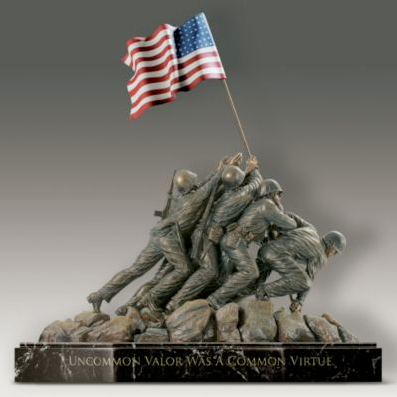 1951: De Weldon is commissioned to build a memorial to the Marine Corps. He begins work on converting the smaller sculpture into a 32 foot high monument. 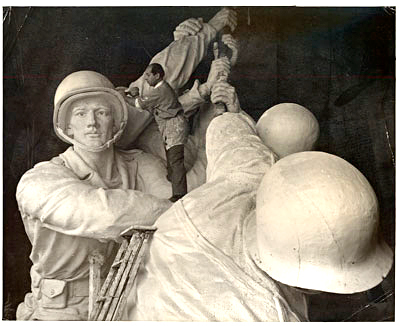 November 1954: The massive bronze sculpture, 78 foot high on its pedestal and weighing 100 tons, is dedicated by President Eisenhower at Arlington National Cemetry, in front of a large crowd. 1954 to today: Numerous souvenir models of the statue are sold, as well as various other kinds of merchandise. 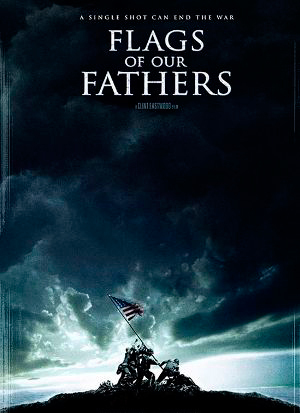 2006: Clint Eastwood’s film Flags of our Fathers is released, covering many of the events of 1945 relating to Iwo Jima and the mythical photograph. 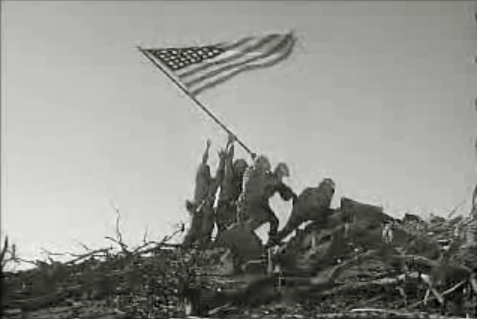 2006: The film features a detailed reconstruction of the raising of the flag, and shows Sgt. Genaust and Joe Rosenthal photographing the event. 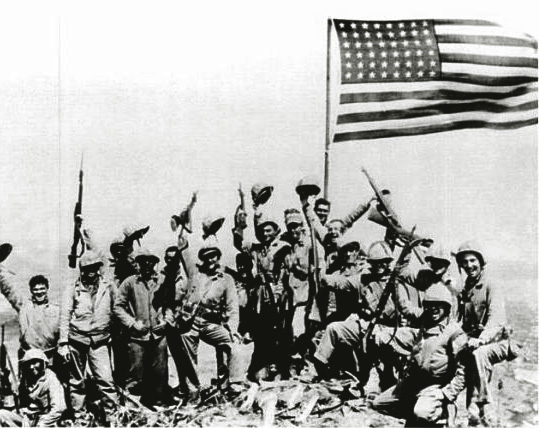 See my other posts on this subject: Iwa Jima photograph 1 and Iwa Jima photograph 3. The famous World War II image of the raising of the US flag at Iwo Jima is one of the most influential photographs ever made. Taken by Associated Press photographer Joe Rosenthal on a Speed Graphic (I have one!) 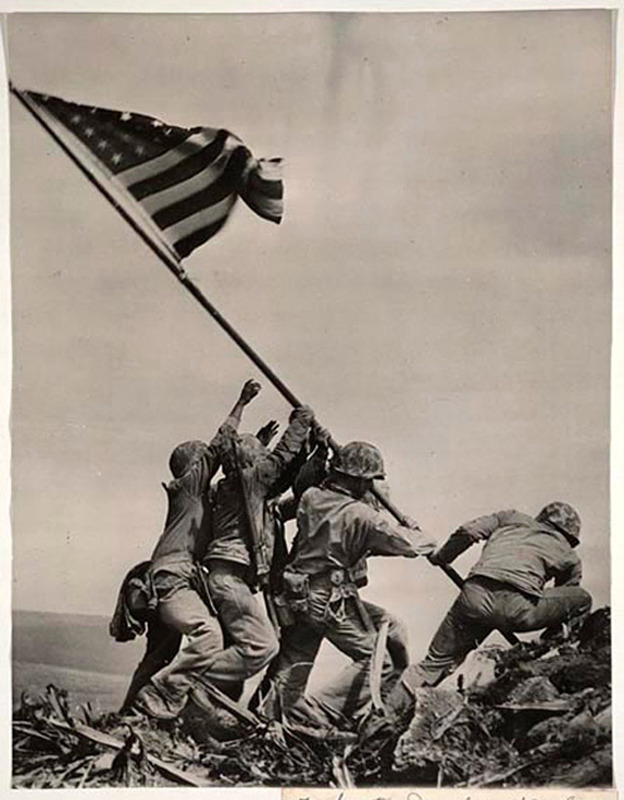 the picture was immediately seen as iconic and potentially useful as propaganda in the war effort. 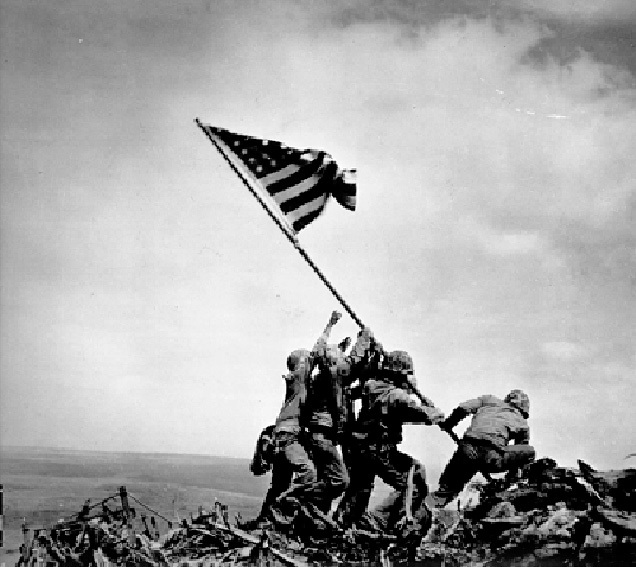 It was published widely and turned the photographer and the marines lifting the flag into celebrities. This is all detailed in Clint Eastwood’s 2006 film Flags of our Fathers. Rosenthal’s picture is an example of a mythical photograph, one that takes on meanings outside of what is depicted, acquiring an aura of historical significance. It encapsulates one of the puzzles about photography, how an image that is snapped at a fraction of a second, often without much special thought, can become an artefact imbued with symbolism and facets of meaning that are not objectively contained in the representation. The original print version – just a small sheet of paper – gave birth to two Hollywood movies, a gigantic sculptural replica, numerous coins and medallions, a postage stamp and various kitsch merchandise. All this from 1/400th of a second. It is an enigma. 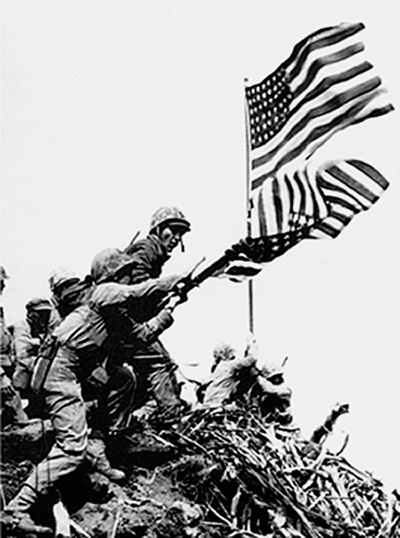 The Iwo Jima photograph, because of its iconic status and wide influence, offers itself as a case study in the medium of photography and its social and political uses. In this and some subsequent posts I’ll endeavour to unpack this subject, looking first at what happened on the day, and later on some of the photograph’s subsequent incarnations. First, did you know there were other photographs taken that day? 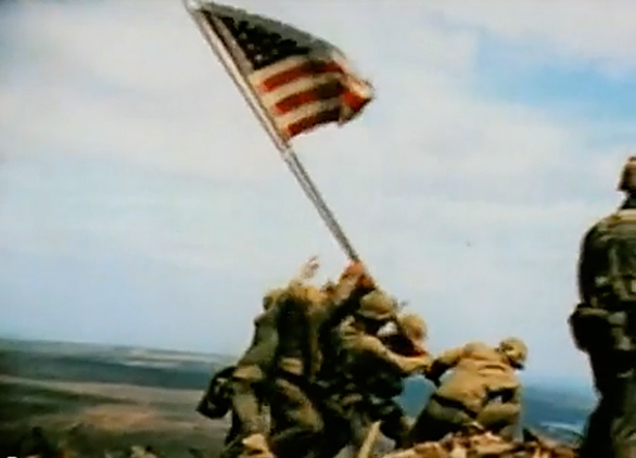 The capturing of Mount Suribachi, the highest peak on the small strategic island of Iwo Jima, was recorded by several photographers attached to the Marine force. There has been confusion and suspicion about what really happened and who shot what almost from the day it was made, but here is a timeline of the events. 2. February 23 1945. At about 2.35pm, because it can’t be easily seen from the landing beach below, the flag is lowered and a much larger flag is raised. This exchange of flags is recorded by Marine Photographer Private Robert R. Campbell. 3. February 23 1945. 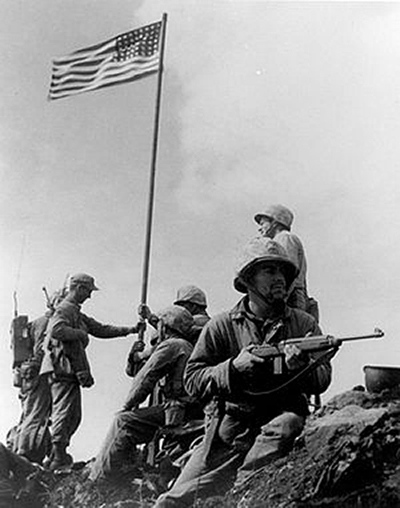 At about 2.35pm, Joe Rosenthal, an Associated Press photographer “embedded” with the Marines, photographs the raising of the second flag. This shot will become the iconic Iwo Jima image. 4. February 23 1945. At about 2.35pm. Just to the right of Rosenthal, Marine Cameraman Sgt. William H. Genaust shoots colour cine film of the same moment. 5. 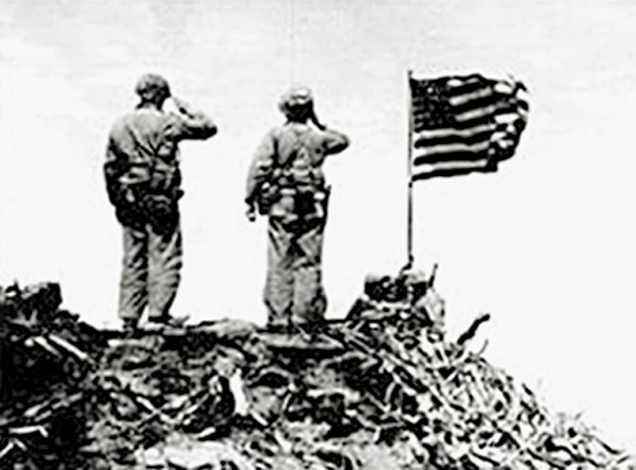 This moment is depicted in Clint Eastwood’s 2006 movie, Flags of our Fathers. 6. When the flag is up, Private Campbell takes a photograph of two soldiers saluting. 7. 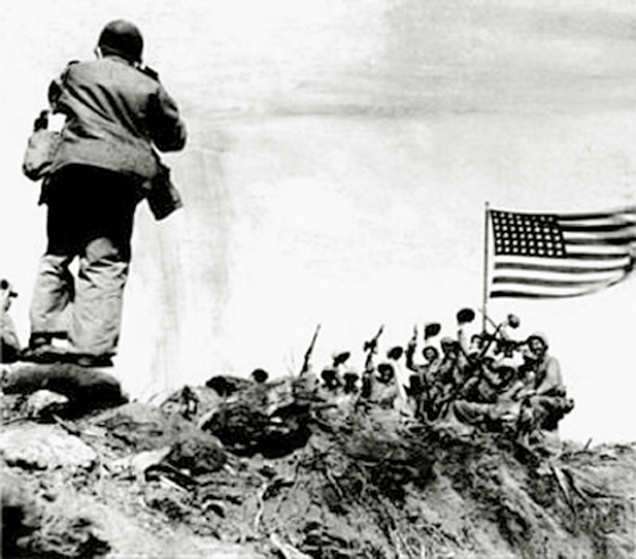 A few minutes later, Private Campbell captures Joe Rosenthal taking a group photograph of Marines under the flag. Sgt. Genaust’s cine camera can just be seen on the extreme left, filming the marines. 8. Joe Rosenthal’s group photograph. Both his and Campbell’s photograph were taken at the same instant. 9. 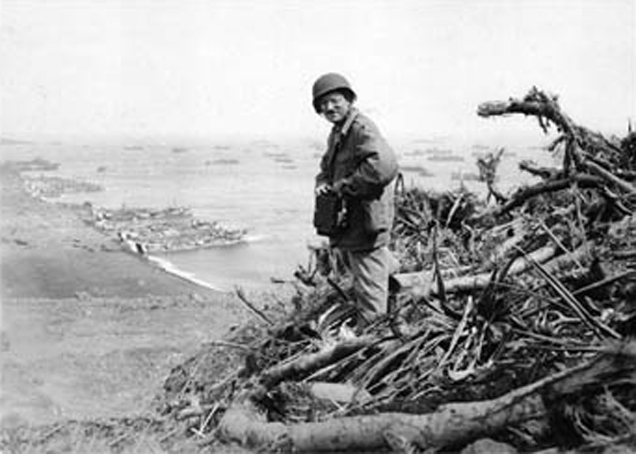 Private Campbell takes a portrait of Joe Rosenthal on top of Mount Suribachi, with the landing beach seen below. February 25, two days later. Despite military censorship, Rosenthal’s photograph is published in the Sunday morning issue of the San Francisco Chronicle, only about forty hours after being taken.